What happened to the “Sunrise Yoga” video on YouTube?! 4 comments Jun 5, 2016 | Sunrise Yoga?! Home \ What happened to the “Sunrise Yoga” video on YouTube?! 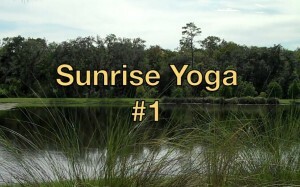 Many of you have been asking me “Where did your ‘Sunrise Yoga’ video go on YouTube?”. Watch the video below and find out where it went and hopefully where it will appear again. Thank you for your intense support of this very popular beginner yoga routine. I really appreciate your support! Sean, thanks for the update. Sunrise was the first of your work I found when I started looking for something to keep me more stretched as I age. I’ve been busy at work and getting more movement while at work, so hadn’t used Sunrise for a while. SOOO disappointed that it was down. I smiled when I learned your Opera background. I’ve sung Barbershop for 27 years–one of the real triggers to get me doing some sort of workout was gradually losing my ability to move on stage. Your videos have helped my breath support and ability to perform. I’ve been subtly incorporating some of the easier stretches into our warmup routines, though they have to be pretty low impact, our guys range from 16 to 92! So sorry this happened. I LOVE that video and was so upset when I couldn’t find it any more. Thank you for the thoughtful update and I’m sorry about you bike too!